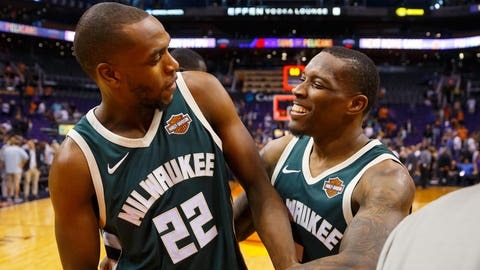 The Milwaukee Bucks enter the final night of the regular season with the NBA’s best offense at 118.1 points per game. All five members of the Bucks’ typical starting lineup reached 1,000 points this season: Giannis Antetokounmpo (1,994 points), Khris Middleton (1,386), Eric Bledsoe (1,241), Brook Lopez (1,009) and Malcolm Brogdon (1,001). Brogdon has been out since March 15, but is likely to return at some point, should the Bucks make an extended run through the playoffs. The only other squad to have five players reach 1,000 points with the same team this season: The Oklahoma City Thunder, who visit Fiserv Forum on Wednesday. Oklahoma City has gotten at least 1,000 points from Paul George (2,159 points), Russell Westbrook (1,660), Dennis Schroder (1,192), Steven Adams (1,104) and Jerami Grant (1,062). Wednesday night’s contest should be close right to the end. Milwaukee and Oklahoma City rank one-two this season margin of defeat. The Bucks have lost by an average of just 6.7 points this season, while the Thunder are at 8.3. Both teams have controlled the glass on the road this season. Oklahoma City has a rebound differential of plus-2.7 this season, while Milwaukee is just behind at plus-2.44. — Thunder star Westbrook is one of only four players to reach 15,000 total points, 5,000 rebounds and 5,000 assists in his first 11 NBA seasons, joining LeBron James, Magic Johnson and Oscar Robertson. — Westbrook and Antetokounmpo are the only players in the past 35 years to have 30-plus games of 25-plus points, 10-plus rebounds and five-plus assists in a single season. Giannis has 30 this season while Westbrook had 43 such games in 2016-17. — No player who averaged 20-plus points per game stepped up more than the Thunder’s George this season. George averaged 21.9 points per game last season, and is up to 28 points per game this year. — Lopez has made 56.9% of his field goals outside the paint this season. He trails only the Dallas Mavericks‘ Dirk Nowitzki (89%) and the New York Knicks‘ Luke Kornet (71.4%) amongst 7-footers.